Your personalised suitcase is a travel essential, perfect for globe trotters & weekend trips away. Featuring TSA approved lock technology, four wheels for easy manoeuvrability and printed with your gorgeous photos or designs, your cabin sized luggage suitcase will standout on the baggage claim carousel and turn heads on the 'runway'. Extend your personal style all the way to the airport and beyond with our custom printed suitcase. It's the perfect size for personalised hand luggage or a weekend suitcase, allowing you to take just the right amount of clothes etc for a short break. Featuring your gorgeous photos, artwork or name, it's easy to spot amongst other generic bags. Design your own suitcase today and show off your personality. We ordered a suitcase as a birthday present. The site was easy to use, the delivery was super speedy and the product seems good quality, as is the printing - very happy. Important: The keyhole is for a TSA scheme allowing customs to open your bag without damaging it. The combination lock uses the ends of the zips. The lock is set at the manufacturer to open at 000. You can set a new one using the instructions above. For couples who enjoy long weekend breaks in the country, this is the ideal gift for them to pack their belongings into. Custom printed with a photo of them, or perhaps a landscape photo of their favourite city, they'll be eager to get away as often as they can. If your other half has to travel a lot, then why not design a suitcase for them, allowing them to carry a photo of the family around? Select your most special photos of you and the kids so this way, the family are always with them and they don't have to go far to see a smiling face. (And you will always spot your suitcase easily on the belt or in the cabin). If you've got a fleet of employers who travel regularly for business, the photo suitcase is the prime opportunity to spread brand awareness and maintain professionalism at all times. Upload your logo and other brand assets to create a smart personalised suitcase that can become part of the uniform. At the airport, all staff and fellow passengers will know it's a business trip, so might even be more respectful in regards to using laptops etc. Like many of our products, the luggage suitcase comes with a quantity discount, so buy one for all the family or team members and save money. Your suitcase is hand-assembled by our expert team in our bespoke London facility. Your photo is printed onto paper which sits under a light plexiglass creating a beautiful, glossy effect. Long-lasting print does not rub away or scratch or peel off. Note: This custom suitcase fits most carry on cabin luggage sizes, but please check your airline for their latest dimensions as airlines do alter them from time to time, and one airline may be different to another. When your suitcase arrives there may be a layer of film on the back cover, which can be gently peeled off before you use your suitcase. The casing design means that each rounded corner is protected with part of the shell, so when you design your own suitcase, check the preview to make sure important aspects of your photo aren't cut out. The print is vibrant and colours really 'pop'. The Perspex covering your design just adds that extra glossy effect. For a more modest effect, you could create your own design and then add your initials, or use a photo with initials. You could even use your company logo on your suitcase for business trips. 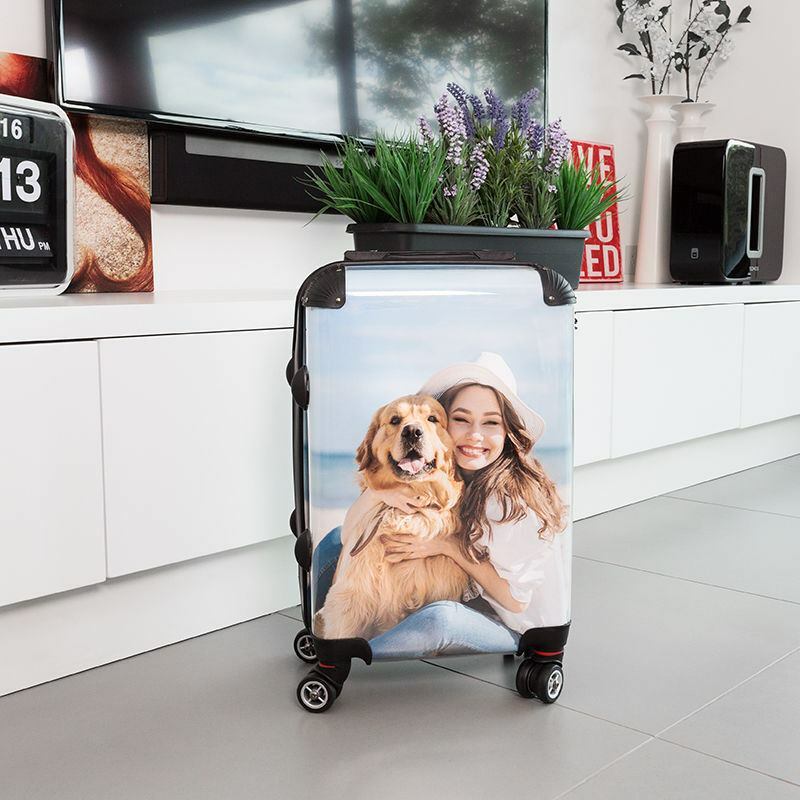 Why not print a photo of your dog or even your face on your suitcase, you can even make a repeating pattern design with lots of small pictures too. Create your own school bag tag and make sure your kid's bag never gets lost in the crowd again.